Digital cameras take full color photos, and normally strip away information to give the image the user wants. I'm pleased with the original color image, but I wanted to show the berries as gleaming gems, hanging on the branch, tantalizing for the birds. By taking away the color, I hope that the viewer can concentrate on the shape and the weight of these juicy pearls. Oh, and squashberries? 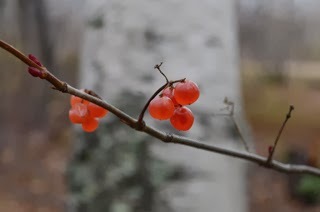 That's the local name for the high-bush cranberry, Viburnum edule. Humans like them too. 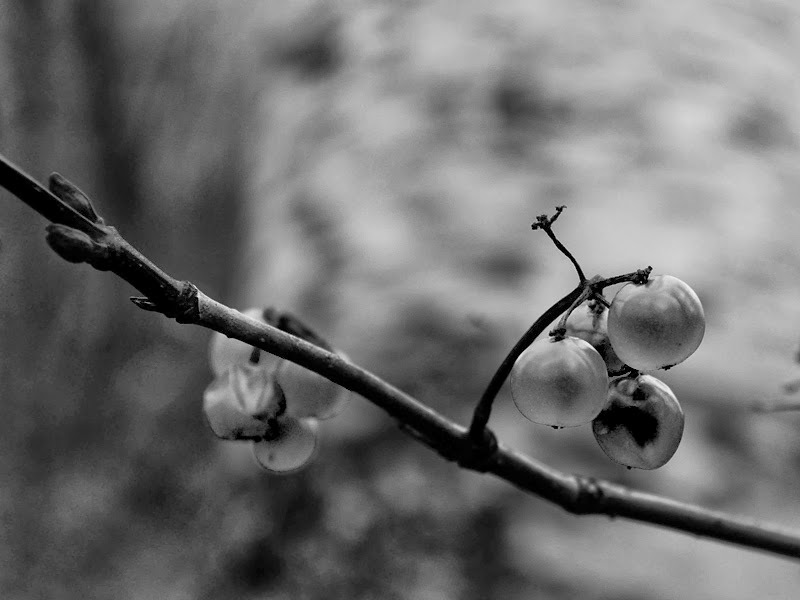 In the black and white version, the berries DO look like gems. At first I thought they might be Christmas ornaments on an outdoor tree. Very poetic and magnetic... and yes, the black and white DOES make that difference. Y'know, sometimes when you look too hard at an image, it gets hard to "see" it after a while. Thanks Julie, for your comment! I'm glad the black and white version works! I independently thought of mirror-shiny ornaments, too! But that RED sort of brings the holiday season to mind, so maybe I was pre-primed to see that. idk Anyway, such a precise focus depth -- awesome. Perhaps I should post the color version as well? Or make it into a holiday image? I saw the mirror-shiny ornaments immediately in the black and white version, but I had peeked at the color one first. If that makes sense.